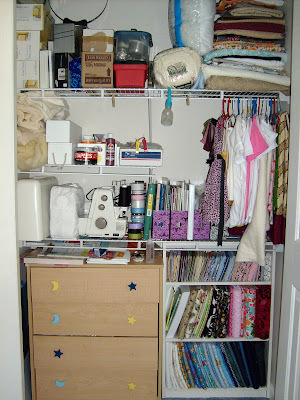 I mentioned in my last post that I spent last weekend cleaning and organizing my sewing room. 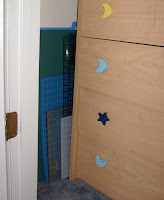 Well here is a peek at my crafting space, well the closet anyway! 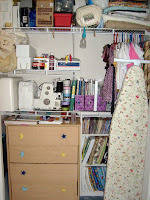 I will be showing you in an upcoming post, how to organize your fabric stash. Top shelf: Extra Lamps, empty boxes, patterns (in that brown box), hairbow/ponies supplies, misc tools in the toolbox, some batting and fiberfill, my less often used fabrics like upholstery and felt. Hanging: you see my completed items and works in progress. Bottom shelf: my Kenmore sewing machine, my Brother SE-270D embroidery machine, my Kenmore serger, ribbons, magazine files (handy for sorting magazines, craft books, and sewing machine manuals). Behind the hanging clothes is my iron, which I love - thanks mom! - a Rowenta Advancer! Also my starch, my "air in a can" useful for cleaning your machines and my machine oil. 1st Drawer: work in progress quilt tops, and embroidery attachment for my Brother machine. 3rd drawer: crochet/knitting stuff, blanks, some finished projects. 4th drawer: socks! yes socks! for making my baby leg warmers! The bookshelf: All of my fabric yardage! The top shelf has all of my less than 1 yard fabrics. The remainder shelves hold anywhere from 1 to, I think, 8 yards. Like I said I will be teaching you how to accomplish this shortly.